Studio environment and the importance of creating a fun space to exercise! Group Fitness rooms have an interesting look and feel in my opinion based on what we use them for. Think about it, hard wood floors, mirrors, equipment stacked in the corners, florescent lighting, slightly sterile I might say and not exactly warm and welcoming, especially for our first time exercisers. That may sound harsh, but really, they do not really create a warm, welcoming environment. Not to say that all group exercise rooms have this feeling to them, actually in the past few years I have seen a shift in the appearance look and feel of the group exercise studio's and the environments as a whole are really warming up! Club managers and owners are getting more creative and taking risks to bring more of an environment to studios and members are responding well. At Les Mills South Central we put effort into building a studio for this very reason. We wanted to provide an example of the potential of a powerful and fun environment to encourage creating a powerful group fitness experience for members and instructors. 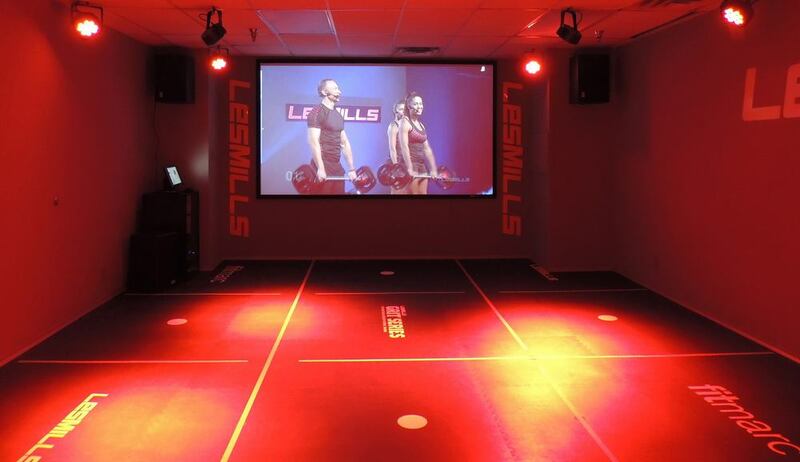 I have included a picture above of the Fitmarc/Les Mills South Central Studio to aid in a visual to show you how fun you can really make your group fitness space! I would encourage you if you have not evaluated this footprint in your club to check it out and see if there are any enhancements to be made. Something as easy as adding colored lighting and dimming the lights can make a world of difference! If you have a studio you are proud of and would like to share, please send it to me! I would love to add it to this collection to share! New Year... Wait, what about March?! Kick your shoes off and get busy!